Every day in school more than 100,000 children from low-income families in Northern Ireland have access to a nutritional lunch funded by the Department of Education. But who fills that void for struggling families during the eight week school break? Lindsay Fergus investigates. Voluntary organisations working with some of the most disadvantaged young people fear that more than 100,000 children – some as young as two - could be missing out on their main daily meal or existing on poor diets in July and August. There are strict criteria for free school meal entitlement including being in receipt of certain benefits, a household earning cap of £16,190, being the child of an asylum seeker or “if none of the above apply and a child presents at school hungry, then the school should, on humanitarian grounds, provide free school meals to the child”. But that entitlement begins and ends at the school door with no government body filling the void during the two month holiday period when hard-pressed families may also have additional costs. For Belfast-based asylum seeker Sipho Sibanda, whose child is in primary school, the summer “brings terrible hardship on families”. The postcode area with the highest percentage of free school meal entitlement is BT12 - the Sandy Row and Village area of Belfast - where 74% of children (3,863) will lose access to a free meal when schools close later this month. 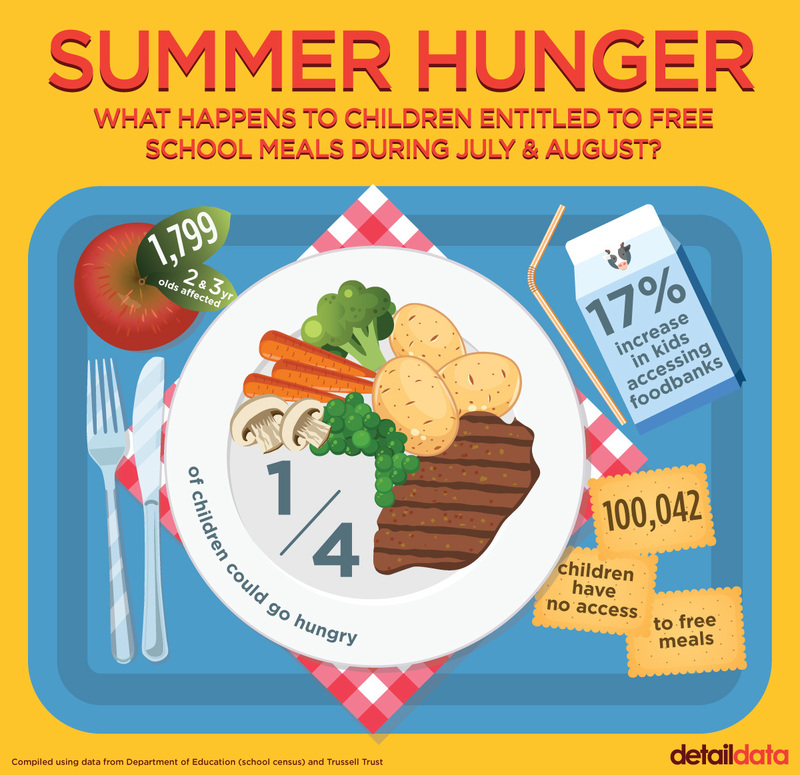 196 schools in the most disadvantaged areas offer breakfast provision meaning some young people may be missing out on two meals during summer. We have also mapped below school meal entitlement by children’s residential postcode in Northern Ireland to show the areas which could be most affected this summer. Tony Graham, director of Devolved Nations at the Trussell Trust, which operates 24 foodbanks here said: “Families in Northern Ireland who rely on free school meals during term time can find themselves facing hunger in the school holidays, when there is an extra financial pressure to provide main meals. The Department of Education said it does not have a budget for the provision of meals outside of term time and could only fund such a service by making cuts elsewhere while the Department for Communities, which has responsibility for benefits, commented that those in crisis could apply for Discretionary Support or a Short-term Benefit Advance. One solution put forward is for a collaborative approach involving the public/private and voluntary sectors. During July and August 2015 – the latest data available from Trussell Trust - its Northern Ireland foodbanks provided 3,143 three day emergency food supplies to people in crisis - 1,395 of these went to children. For comparison, in the previous two months 2,944 emergency supplies were provided - 1,189 of those for children. In a bid to establish the extent of the problem, Stormont’s All-Party Group on Children and Young People will be today holding an evidence session on hunger amongst children during the school holidays at Parliament Buildings. Children in Northern Ireland (CiNI) has also been spearheading a Holiday Hunger campaign. Westminster’s All Party Parliamentary Group on Hunger raised concerns in April that “the burden could be particularly heavy in Northern Ireland” due to the longer summer holidays. According to the Department of Education “the provision of free school meals offers targeted support to families on low incomes.... aimed at those pupils deemed to be most in need and are provided to ensure that eligible pupils have access to a nutritious meal which is suitable as the main meal of the day”. Oven baked fish, garden peas and chips/baked potato and a coconut cookie. Roast turkey, stuffing, gravy, carrots, cabbage, roast/mashed potatoes, lemon sponge and custard. Spaghetti bolognaise, ice cream and fruit. Bread, fresh fruit, yogurt, milk and water are also available. Dessie Donnelly from Participation and the Practice of Rights (PPR) warned of the impact of food poverty during the school holidays. He is particularly concerned about the impact on asylum seekers who are barred from working and receive just £36.95 per week in Government support. Detail Data has previously reported on asylum seekers, which can be accessed here. According to Education Authority figures for the current school year there are 198 children of asylum seekers entitled to free school meals. “The Executive needs to adopt a different approach to asylum seekers than the disastrous, divisive and demeaning one promoted by Westminster,” he said. “The provision of free school meals to children of asylum seekers, which is a positive and humane measure by our Executive, creates an anomaly. The fundamental rights of children are not constrained to school term times. New information provided to Detail Data from the Department of Education portrays a clearer picture of the 100,042 children (30.6%) who are affected by the loss of a nutritious free lunch during the holidays. An age breakdown of free school meal entitlement shows 1,799 are aged two or three years old and in full-time nursery/reception classes in primary schools; 62,841 are between four and 11 years old and 34,446 are 12 or older. It also reveals that more than 38,000 school age children who are entitled to free school meals are living in Belfast City (46.2%) and Derry City & Strabane District (43.3%) council areas; making them the worst affected council areas. The new data - provided to Detail Data by the Department of Education - is from the October 7, 2016 Northern Ireland School Census and the Northern Ireland Schools Meals Census. Voluntary organisations believe the solution to holiday hunger is government, businesses and the voluntary sector working together. Some local authorities are already collaborating to address food poverty, according to the Northern Ireland Local Government Association (NILGA). However, the logistics and cost of opening up schools to provide free meals during the summer would be “extremely challenging” explained the Department of Education due to issues including staffing, premises and transportation. The complexity is compounded as not all schools have a production kitchen. “During term time the cost of operating the kitchen facilities, or providing a meal from another source, is effectively split between those pupils in receipt of free school meals and those that would pay for a meal. If only pupils entitled to free school meals were to be using the facilities outside of term time, the individual cost per pupil would be significantly higher,” explained a department spokeswoman. The Department for Communities has said it will meet with Children in Northern Ireland (CiNI) to discuss its campaign while the Public Health Agency (PHA) is exploring ways to work with CiNI to support its programmes. "The Department's statutory welfare support arrangements and our employment support programmes are designed to provide adequate support for families as well as sustainable long term interventions that can provide people with pathways out of poverty," said a Department for Communities spokeswoman. This summer voluntary organisations including Children in Northern Ireland, Community Intercultural Programme, Barnardo’s NI and Trussell Trust will be running schemes to help struggling families. At Foyle and Lisburn Foodbanks holiday clubs with up to 30 children per session will participate in activities and receive a hot nutritious meal. Strabane Foodbank is also offering a breakfast programme. Trussell Trust’s Tony Graham said: “Foodbanks in Northern Ireland already provide additional help to families who struggle to put food on the table outside of term time, and the holiday clubs run by foodbanks are a crucial step in broadening the support. Children in Northern Ireland has joined forces with Community Intercultural Programme to host a summer project in Portadown which will involve 80 young people. As well as receiving a healthy lunch and snacks the kids, aged from eight to 15, will be taking part in activities to improve their health and wellbeing. They will also be undertaking certificates in health and hygiene and first aid to promote learning. Ellen Finlay explained: “The plan is to refine the model. We know we still have some learning to do but the idea is to try and get the model right so that other organisations can take the model and run with it. "I completely understand that departments and politicians find trying to address child poverty difficult but this is a solution."